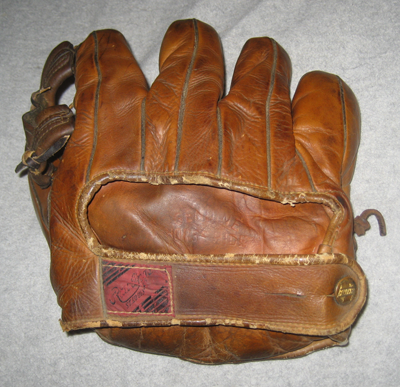 Vintage Baseball Glove Forum • View topic - Forbes Story on Cookie Lavagetto's RR Glove for Sale!! Forbes Story on Cookie Lavagetto's RR Glove for Sale!! BTW, I loved OakDoak's story about his RR. Re: Forbes Story on Cookie Lavagetto's RR Glove for Sale!! Neat article. Looking back, it's hard to believe that players' gloves, bats, etc. carried little value back then, before the advent of collectors. I read recently that the Yankees' second baseman at that time, George "Snuffy" Stirnweiss, furnished his den with game bats from Ruth, Gehrig, and DiMaggio. He sawed them lengthwise to mount them flat against the wall. Also remember reading about how Branch Rickey put his kids to work cutting up old uniforms for rags at the end of each season. Who knew? Is that your Rawlings RR in the bottom photo of the article? That's a beauty, the nicest one I've ever seen. Yes, you're so right about what little value this memorabilia had. I've written Forbes posts about Carlton Willey building a bannister with his All Star and WS bats. Joe Phillips says the Yankees would pass around Hefty garbage bags to throw their gloves in. 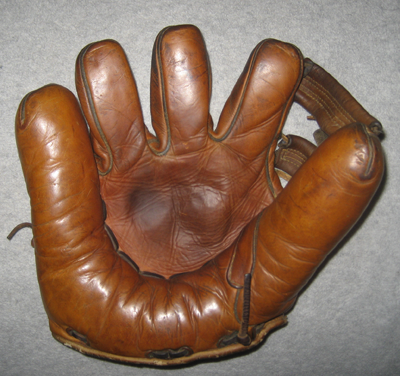 I love the tale of your RR glove. What a labor of love for you. Your's looks amazing. To find one this great in this day and age is a miracle. Yes, that's my RR. I was lucky on eBay about five/six years ago. I simply typed in Red Rolfe Glove and it came up in an auction. No Rawlings, vintage baseball, etc.in the title. I paid $600, so it wasn't a steal, but I'm happy. Here's the front below. One thing I wonder is why there's no Deep Well Pocket. Maybe it predates that. I've read that Deep Well was patented in 1940. Aside from the cool web on the RR, I always thought that the laced down pocket was really innovative. Rawlings only featured that on one other 1940's model that I know of, the Merrill May MM. And it wasn't until the early 1950's that they laced the pocket again. Maybe it was just too far ahead of its time, like the finger laced Ken-Wels. Odd that the Lavagetto glove isn't laced like that. Maybe it was a very early model? Here's a Merrill May with a Doak style web.